At water treatment production sites wash water is produced as a result of backwashing sand filters. The backwash water contains the accumulated solids retained in the rapid gravity filters during filtration. It is common practice to look at options for reusing the wash water. As a result wash water treatment schemes are implemented. Wash water normally contains up to 2 g/l of solids and as a result the treatment set-up consists of a series of processes: coagulation – flocculation – settling – moving bed filtration - (disinfection). The MBF is capable of handling high solids concentrations and is still able to reduce the solids concentration and turbidity in the filtrate to levels low enough to reuse the water in the primary process. Reuse of wash water enables the drinking water authorities to save up to 5% of the primary production volume, which should otherwise be discharged at high costs. 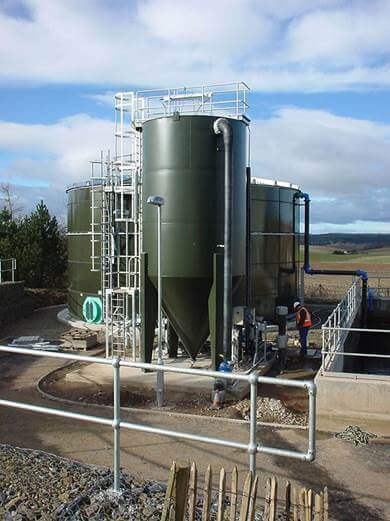 Investments in wash water treatment schemes in both drinking water and process water schemes are often already economically viable because of the reduced volume of waste water generated and smaller sludge volumes to be discharged.